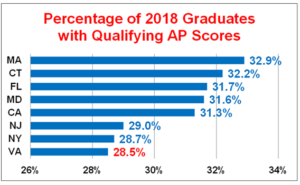 According to the Virginia Department of Education in their press release dated February 6th, nearly three out of every 10 of Virginia’s 2018 public high school graduates demonstrated college-level achievement on at least one Advanced Placement examination, according to data released today by the College Board, the nonprofit organization that manages the AP program. The College Board reported that 28.5 percent of the commonwealth’s 2018 graduating seniors earned a score of three or higher on at least one AP test. Nationwide, 23.5 percent of graduating seniors achieved scores of three or higher. The commonwealth ranked eighth in the nation in AP performance. The MLWGS Class of 2018 had 180 graduates. 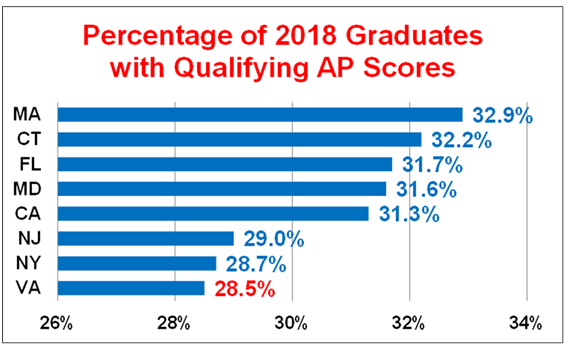 Our students scored 97.2% on Qualifying Scores according to the AP Equity and Excellence Report for seniors who scored 3 or higher on at least one AP Exam at any point during high school divided by the total number of school seniors. Congratulations to the MLWGS Dragons for their extraordinary achievement! Congratulations are also in order to our outstanding faculty and counselor leaders who make results like this possible for their students.